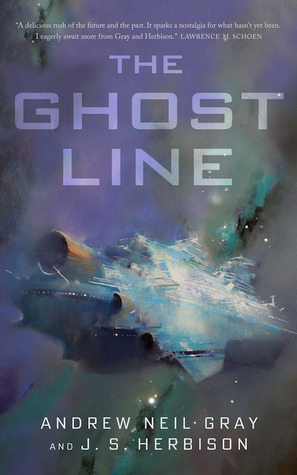 The Ghost Line is a short story that surrounds four people on a mission to hijack an abandoned space ship named the Martian Queen. ➽ Saga – Our main protagonist, married to Michel, is obsessed with exploring abandoned ships and has a fan-base from her haunted finds. ➽ Michel – The husband of Saga and one of the most sought after hackers in the universe. ➽ Gregor – A Russian pilot with a drinking problem. ➽ Wei – The woman who hired these three crew members, even though she answers their questions about the mission very begrudgingly, while keeping many secrets close to herself. Saga and Michel accept Wei’s mysterious mission, even though they were going to settle down and start a family, because the money she offered them was tremendous. I’m guessing that is also why Gregor accepted, but it is never clearly stated. The Martian Queen was once a great and luxurious hotel ship, equipped with casinos, spas, nightclubs, and even more built inside. While active, it was a home and place to sleep for people traveling between Earth and Mars. Now, the ship still travels back and forth from Earth to Mars, constantly being lead by our orbit, even though it hasn’t had a crew or passengers for twenty years. This story feels like you’re walking through and exploring what’s left of the Titanic, but in space. It feels eerie and ominous, while you’re trying to piece together the mystery of this ship and why it is still part of our orbit. I am not sure I would consider this part of the horror genre, but it is for sure creepy and will leave you on edge while reading. This is ultimately a story about love and loss, and making sacrifices that you don’t ever believe you are brave or capable enough to make until you are forced to make them. I loved the message, and I very much enjoyed the ending, but I still feel like this was too grand of a story for only 70ish pages. I, personally, feel like it would be been much better as a full length novel, or even if 100 extra pages were tacked on, so we could have explored more of the ship, more of the characters, and more of the mysteries. Instead, I feel like the message was way less impactful and I wasn’t nearly as invested as I probably should have been. This definitely wasn’t a bad read; it just left a lot to be desired and a lot of questions to be answered. I would be very interested in a continuation short story, just to see how certain people felt with the conclusion. Yet, I do think this is a decently strong story to stand upon its own, too. Regardless, this was a good short story, and for sure worth the short amount of time it takes to read! Novellas can be tricky if the length isn’t right. But this sure sounds like my kind of story, I may read it a little closer to the publication date.